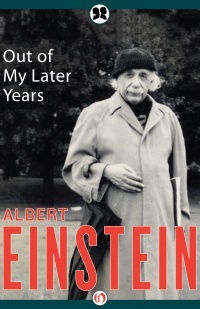 An inspiring collection of essays, in which Albert Einstein addresses the topics that fascinated him as a scientist, philosopher, and humanitarianDivided by subject matter—“Science,” “Convictions and Beliefs,” “Public Affairs,” etc.—these essays consider everything from the need for a “supranational” governing body to control war in the atomic age, to freedom in research and education, to Jewish history and Zionism, to explanations of the physics and scientific thought that brought him world recognition. Throughout, Einstein’s clear, eloquent voice presents an idealist’s vision and relays complex theories to the layperson. Einstein’s essays share his philosophical beliefs, scientific reasoning, and hopes for a brighter future, and show how one of the greatest minds of all time fully engaged with the changing world around him. This authorized Philosophical Library edition features rare photos and never-before-seen documents from the Albert Einstein Archives at the Hebrew University of Jerusalem.